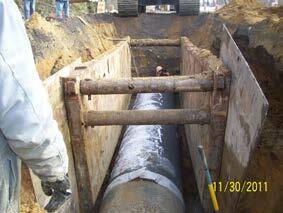 Transmission Main Construction Services; 42-inch Water Main in 24 Mile Road Macomb Twsp. NTH Consultants, Ltd. (NTH) was retained by the Detroit Water and Sewerage Department (DWSD) to provide construction engineering services for the installation of approximately 14,000 feet of 42-inch diameter transmission main. The main was installed in 24 Mile Road between Foss Road and Fairchild Road located in Macomb Township, Michigan. The project also included 12 gate valve chambers and 21 entrance manhole structures. Services provided by NTH and our subconsultants included backfill testing, concrete testing, pavement testing, submittal review, request for information (RFI) responses, and surveying. NTH also provided periodic construction oversight services. NTH provided construction oversight during critical activities including gate valve installation and mining activities under exiting roadways. Our services included that facilitation of survey “cut sheets” and rapid review of submittals and contractor’s RFIs. We attended construction progress meetings with DWSD and the contractor to resolve design and implementation related issues expeditiously. During construction activities, NTH periodically observed and documented undercut operations to remove unsuitable soils, water main installation, gate value installation, and open cut and mining operations where applicable. NTH personnel determined moisture content and in-place density of backfill materials using a nuclear moisture-density gauge to verify compliance of the materials. Our observations were documented in Daily Field Reports (DFRs) that were submitted to DWSD on a regularly scheduled basis. NTH reviewed proposed materials and mix designs of concrete for compliance with project specifications. Our field representatives observed concrete placement and performed the necessary field testing including molding concrete test cylinders for compressive strength testing. Compressive strength tests were performed by our laboratory at the frequency determined by the specifications. Results of tests were shared with DWSD in real time to help keep the project on schedule. Observation and documentation of asphalt placement was also performed. Inplace density tests on the finished pavement were performed to verify compliance with compaction specifications. Laboratory testing also included extraction testing and sieve analysis to compare to the mix design criteria. NTH and our subconsultants worked closely with DWSD and their contractor to help provide a well-built product for the residents of Macomb Township. By being involved from the onset of construction, NTH helped DWSD and their contractor stay on schedule and budget, while limiting the impact to local residents on this busy roadway.